To the illumined mind the whole world burns and sparkles with light." 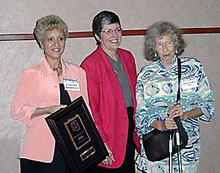 Gardens for Humanity was honored on February 6th, 2004 with an exciting award! We received the national "Take Pride in America" award in recognition of our outstanding use of volunteers in creating gardens. This was presented to our Founder, Adele Seronde, at a ceremony at our Phoenix Demonstration Garden by the Secretary of the Interior and the Governor of Arizona. Click Play button to start movie. A crowd of local Gardens for Humanity members and Master Gardeners and other dignitaries were in attendance. Aimee Beth Ward, Master Gardener and Gardens for Humanity's Project Director and former Board Member for our Phoenix Demonstration Garden showed Governor Janet Napolitano the various herbal healing beds and other parts of our garden while awaiting the arrival of the Secretary of the Interior. Taffy Lanser, Labyrinth designer of the small labyrinth in the Healing Garden and the large one at The Lodge in Sedona, was also there to explain the many uses and benefits of this ancient tool. Current Gardens for Humanity Board members Dan Finn, Michael Baker and Rose Marie Licher attended, as did several former Board Members.